Chinese meals should carry a health warning on packaging and menus after a NEW survey8 by Action on Salt (formerly Consensus Action on Salt and Health, CASH) based at the Wolfson Institute, Barts & The London, Queen Mary University of London has exposed the astonishing and harmful amounts of salt found in both Chinese takeaways and Chinese ready meals sold by some of the UK’s biggest supermarkets. The group of leading experts is now calling on Public Health England (PHE) to get tough on setting new salt targets, making front of pack labelling mandatory and put warning labels on menus for dishes high in salt. An analysis of Chinese takeaway meals purchased from six independent restaurants in London’s famous Chinatown district revealed 97% contained a hefty 2g of salt or more per dish. Over half (58%) contained more than 3g of salt per dish – which is half an adult’s maximum recommended daily intake in one portion alone. Combining side dishes would consequently provide far more salt than the recommended daily limit for the whole day (6g/day)9. The saltiest takeaway main with a rice/noodle side dish contained a staggering 11.50g salt (Beef in Black Bean Sauce and Vegetable Noodles from Wong Kei restaurant), the equivalent of five Big Macs1, and getting near to the acute toxic levels of salt10. Alarmingly, the survey also exposed the shockingly large variations in the salt content of the SAME dishes but from different restaurants e.g. the saltiest sweet and sour dish contained a staggering 3.4g of salt per dish – that’s the same amount found in 70 Ritz Crackers11 - whereas the lowest contained just 1g. Consuming the lower salt option would cut your salt intake by more than three times in the main dish alone! Similarly, there was a two-fold difference in salt for Szechuan Beef, ranging from 2.30g-4.60g per dish. Beef in black bean sauce dishes were the saltiest on average (1.27g/100g), whilst sweet and sour dishes were the least salty (0.54g/100g on average). When it comes to ready meals, the saltiest Chinese dish was Slimming World’s Chinese Style Banquet Rice with 4.40g salt per 550g pack – that’s more salt than two store-bought Pizza Express Margherita Pizzas4. 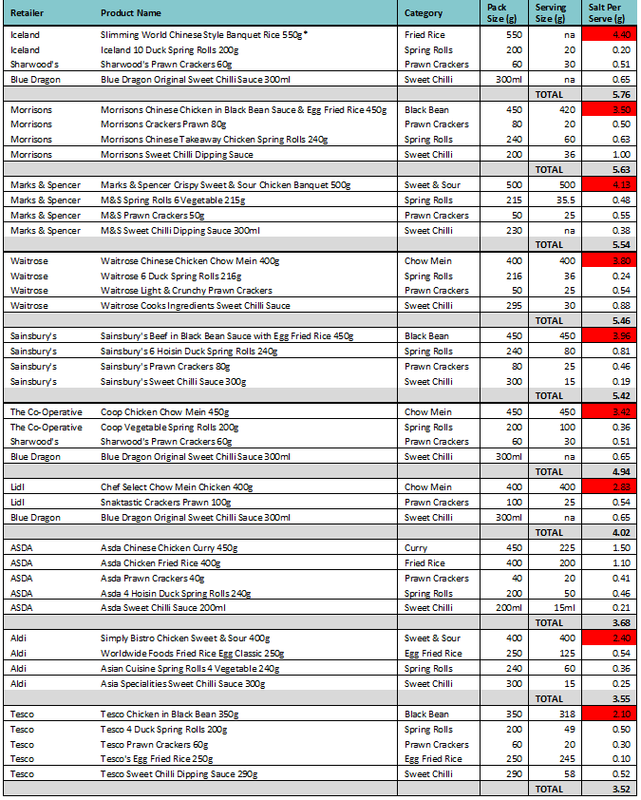 Next in line was Marks & Spencer Crispy Sweet and Sour Chicken Banquet with 4.13g salt per 500g pack, providing over two thirds (69%) of an adult’s maximum daily intake – that's the same as scoffing more than three McDonald’s hamburgers12. The least salty meal was Tesco’s Vegetable Chow Mein (0.40g per 120g portion), followed by Sainsbury’s Sweet & Sour Chicken (0.53g per 175g portion). Of the 141 ready meals surveyed, nearly half (43%) were high in salt (containing over 1.5g/100g or 1.8g per portion) and would receive a red label on front of pack13. As well as main dishes being high in salt, rice dishes and other sides, such as spring rolls and prawn crackers, can add a significant amount of salt to your meal. For example, Iceland’s Takeaway Egg Fried Rice has a shocking 4.1g salt per 350g pack - more salt than 11 bags of ready salted crisps5 - compared to Tesco’s Egg Fried Rice with 0.1g per 250g pack! When it comes to dipping in, consumers should also think twice about sauces, with some containing excessively high levels of salt. Soy sauces were by far the saltiest – on average being over 5 TIMES saltier than seawater14. Incorporating sides and dipping sauces to your meal could provide you with nearly 4g salt per person alone. For example, 2 ASDA Hoisin Duck Spring Rolls and 15ml of ASDA Dark Soy Sauce contains 3.82g salt – more salt than nine servings of peanuts15. The UK was once leading the world on salt reduction, which was shown to be the most cost effective public health programme e.g. up to 2011, the UK salt reduction programme had already saved 18,000 strokes and heart attacks per year, 9,000 of which were fatal16, with £1.5 billion a year in NHS healthcare saving costs, according to NICE17. In 2016, PHE assumed responsibility for UK salt reduction, however so far there has been little action, with no progress report on whether the last set of salt targets (due to be met by the end of 2017) have been reached, nor any plans to set new targets. As part of its 19th Salt Awareness Week (12-18th March 2018) supported by 10 NGO’s18, Action on Salt is calling on PHE for immediate action, as valuable time has been lost and many thousands of people have suffered strokes and heart attacks, many of which are fatal, as a consequence. Every 1g reduction in salt intake prevents 7,000 deaths, 4,000 of which are premature, from strokes and heart disease17. Beth Fowler, Nutritionist at ASDA, said: "Asda has been working hard for nearly two decades to reformulate our own-label products to remove salt, calories, fat, sat-fat and sugar, without compromising on taste or quality. We have made excellent progress: In 2017 alone we removed 386 tonnes of fat, 175 tonnes of saturated fat, 2470 tonnes of sugar and 50 tonnes of salt from our own-label products. Since the data for this report was collected we have also reformulated our Chinese ready meal selection, including driving down salt and we are happy to announce we are launching an own brand reduced-salt soy sauce in July. We now meet the salt targets in 97% of the salt reduction categories, including in Ready Meals." Action on Salt is a group concerned with salt and its effects on health, supported by 22 expert scientific members. Action on Salt is successfully working to reach a consensus with the food industry and Government over the harmful effects of a high salt diet, and bring about a reduction in the amount of salt in processed foods as well as salt added to cooking, and at the table. Nutrition data for supermarket ready meals was collected in-store from product packaging using The George Institute’s Data Collector App. Nutrition information not displayed on the label was sought from the company website. All products were collected from all major supermarkets: Tesco, Sainsbury’s, Asda, Morrisons, Marks & Spencer, Waitrose, The Co-op, Aldi, Lidl and Iceland in January 2018.Five popular Chinese dishes were also analysed from six takeaway restaurants in London’s Chinatown, chosen at random, using Kent Scientific Services to measure their salt content – dishes included a main, a side and a starter and were purchased and analysed in January 2018. Sample size is small; however, this data provides a good indication of the typical salt values in Chinese restaurants across the country. “A New or Old Chinese Restaurant Syndrome?” Letter in the British Medical Journal (Clin Res Ed). 1982 Oct 23; 285(6349): 1205. Salt Awareness Week is supported by Blood Pressure UK, Heart UK, Stroke Association, UK Health Forum, World Cancer Research Fund, Polycystic Kidney Disease (PKD) Charity, Men’s Health Forum, Diabetes UK, Heart Research UK and the Real Bread Campaign.